OK, let's talk about marinas, shall we? Over at the CM Press the self-appointed purveyor of all knowledge continues to rant about wanting the city to pursue the creation of a marina along the Santa Ana River. He talks of "poking a crummy stick in the dirt so the ocean can refill the silted over bay that exists between the Santa Ana River and the bluffs." This pipe dream was cast aside two decades ago and it still isn't a good idea - particularly when it's proposed just to satisfy one guy's perverted wish to be able to dangle his toes in the ocean from a Costa Mesa location. Who, specifically, would own this marina? It seems likely that Newport Beach would have first dibs, since it would front on the Banning Ranch property for the most part - a chunk of land their city leaders have recently decided to pursue. What of Pacific Coast Highway? A major replacement bridge, similar to the Back Bay Bridge, would be necessary to permit watercraft to move upstream to the marina. Few boats could make it under the present bridge. What kind of jetty would be required at the mouth of the river? Anything resembling those forming the entrance to Newport Harbor would certainly adversely affect the beaches to the south. On the other hand, the northern jetty might re-create The Wedge, Mecca for rabid body surfers and others with a water-activated death wish. What of the homes in West Newport? Any widening of the river mouth to permit an entrance to a marina would very likely adversely affect those homes - perhaps requiring several to be removed. 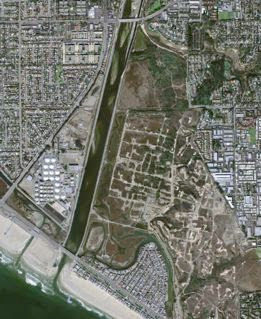 One writer to this blog recently speculated that any marina created in the river would be connected to Newport Harbor via channels below the Banning Ranch property. This adds to the question of ownership. And, with that in mind, maybe this marina wouldn't be accessed via the Santa Ana River mouth at all. Maybe it is reached via those channels from Newport Harbor. That would mean a nice, leisurely 90 minute chug from slip to sea. Sounds inviting, doesn't it? Several thoughtful comments on this issue have been posted to an earlier blog entry. They can be read here. With the track record our city council has in dealing with other government entities of late, I shudder at the specter of them trying to orchestrate an agreement between Huntington Beach, Newport Beach, Cal Trans, the Coastal Commission and any number of other entities with a real or perceived interest in such a project. On the positive side, we might even be able to get Bob Graham's 19th Street Bridge out of such a deal. Yeah, right! Costa Mesa has plenty of real problems with which deal without fabricating a pie-in-the-sky fiasco that would take up valuable staff time, waste precious financial resources and divert the council's attention from real issues. If our pal at the CM Press has such a burning desire to live in a true "coastal city", I suggest that he simply pick up his bags and move to a city that already is one - like Newport Beach, Huntington Beach or Dana Point, for example. I'm sure he would be welcomed to any of those places with open arms (he says, tongue firmly planted in his cheek). I'll hold the door for him. The Daily Pilot reports this morning that the majority on the City Council, led by our young jailer/mayor, has again rejected the Youth in Government program originally proposed by Councilwoman Katrina Foley and placed in the "receive and file" trash can at an earlier council meeting. According to Alicia Robinson's article, (here), Mansoor and his mates questioned the value of such a program during their study session last night. I have no first-hand knowledge of the proceedings - yet - but will review the tape when it's aired on Channel 24 on Thursday evening (or on streaming video if it's available earlier). This is not unexpected, since it was clear at the January council meeting where this was discussed that the majority had no interest at all in this program. It was clear to me then that this was pure political posturing - that they didn't want a program launched by Foley to succeed. Nothing has changed that viewpoint. Several individuals were quoted in Robinson's article, among them the council court jester, Mayor Pro Tem Eric Bever. In typical condescending fashion, Bever is quoted as saying, "The youth in our community, the seniors in our community, the middle-aged people, everybody who has a brain and a mouth and a viewpoint, has access to share those viewpoints." What a crock! This issue apparently was discussed for more than two hours Tuesday night - extremely long for a study session issue - so I can hardly wait to view the proceedings. I hope to glean some insight on the reasons the majority has chosen to reject and disappoint the youth of this city this way. Quite honestly, I don't have much hope of finding rational reasons for their actions - only politically charged rhetoric. We'll see. Foley, who apparently said she won't attempt to revive this program, is quoted as saying, "I know how to count to three, and we don't have three votes." Sad, but true. So, on this Valentine's Day - a day when hearts are on our minds - the mayor and his majority on the council have demonstrated, once again, that they are missing that particular organ. They've shown us, again, that they are intent on removing any program, concept or plan that might demonstrate that Costa Mesa has a heart. Look out, Cupid - they're shooting back! Hang On! Here We Go! The Planning Commission meeting Monday night was a particularly interesting adventure. This was the first meeting with the "5 improvers", or 4 improvers and a question mark, depending on how you view Jim Righeimer. At the beginning of the meeting the assembled throng was treated to a mini-concert by a group of wonderful young children from Rea School. They led the Pledge of Allegiance to our flag, then sang the National Anthem and other patriotic songs. It was a nice touch. Apparently, although it didn't come through to the viewers at home, there was an accompanying Powerpoint presentation on the large screens displaying a recognition of the contributions Bill Perkins and Bruce Garlich made during their six year tenure on the commission - a very nice touch. I couldn't help thinking about those children in the context of our current municipal immigration debate. I found myself wondering how many of them will find themselves separated from one or more parents in the near future as the parent is interrogated after a minor infraction - jaywalking, wrong-way-bicycle-riding, etc. - and end up being deported because they cannot produce adequate identification. The meeting itself was just a little surreal. Following the mini-concert Donn Hall, serving as vice chairman of the commission, clumsily made presentations to Bruce Garlich and Bill Perkins acknowledging their service on the commission before being bounced by the new council majority. Hall's well-intentioned, but inept, attempt at a gracious presentation fell well short of the mark. He didn't even give Garlich and Perkins a chance to acknowledge the presentations and to say thanks to the many people gathered to honor them. I found myself cringing as I viewed the proceedings. That would not be the last time I would cringe that night. After all that hoopla they finally got around to electing new officers - Hall as Chairman and Jim (I'm a realtor here in town) Fisler as Vice Chairman. Some will remember that Hall is a former mayor of Costa Mesa who, during his tenure two decades ago, tilted at more than his share of windmills. Right off the bat the guy who resembles my theoretical character, Your Neighbor, stood before the commission and tried to sell them on the wisdom of the creation of a marina in the Santa Ana riverbed - a pipe dream that was first floated by Hall two decades ago and failed to gain consideration. Hall took this guy's lead, acknowledged that he is "right" - a truly scary concept! Hall, in his role as chairman, finally got around to introducing the new commissioners, Jim Righeimer and Sam Clark. You knew this was going to be an interesting meeting when they decided to consider the last item on the agenda first. Good grief! Hall, crusty curmudgeon that he is, ran what can only be described as a loose ship last night. He seemed not particularly concerned with protocol and did a marginal job of controlling the flow if dialogue - frequently allowing comments to be shouted from the audience. This does not bode well for the future. He's shown us in the past that he cares little for the formalities so important for proper decorum and deliberation on the commission. With him in charge now the commission needs to be watched carefully. He demonstrated a penchant to attempt to consider and vote on items not on the agenda, for example. In what may be an omen of things to come, Commissioner Eleanor Egan - a long time improver - attempted to derail the first item discussed. She launched a long and tedious presentation about how that particular project didn't fit her idea of the Mesa West Urban Plan. Fortunately, Hall slowed her momentum down long enough for Don Lamm, director of Development Services, to leap to the rescue and remind the commission that the urban plan didn't preclude industrial development, only provided a mechanism to insert residential into that primarily industrial area. Any industrial property owner in that area should be very, very worried. This sure looks like the improvers are going to try to change the rules - that agreement that was hammered out over a year's time by the Westside Revitalization Oversight Committee (WROC). I'm not surprised. You will recall that I've frequently reminded all residents to watch their backs, that their rights may be the next trampled by this mob. Well, this is only the beginning. A note about Righeimer. He seems like a very smart fella, who is obviously up to speed on planning issues. I'm withholding judgment on him for a little while longer, but I suspect he'd be a good guy to have in this role - if his appointment hadn't been such a transparent example of political patronage. Time will tell. As provocatively entertaining as the Planning Commission meeting was last night, the City Council Study Session this evening promises to be even more fun. I'd love to have the boxing glove concession for this one. I find myself hoping that Katrina Foley and Allan Mansoor are sitting at opposite ends of the table, to avoid the possibility of nose-to-nose dialogue. Stay tuned. Over at the CM Press this morning the guy who very much resembles my theoretical character, Your Neighbor, presents a schedule of events for his readers to consider. Sound familiar? Anyhow, part of his presentation today is a gloating rant about what he refers to as the no-planning commission, and makes reference to tonight's meeting being the first for the "improver" commission - stating that all the members have ties to the angry group of malcontents who describe themselves as "improvers". In my view, that's a real stretch. Four of the five certainly have strong ties to that group, with Sam Clark being the latest appointee. To say that carpetbagger Jim Righeimer is an "improver" tests credulity. He hasn't even been in town long enough to unpack his bags, for goodness sake. No, Righeimer is occupying that chair as political patronage until something better comes along - a council seat or maybe another run at the Assembly seat held by Van Tran. This perch will give him a place to get some name recognition until it's time to move on. Tuesday's council study session is going to be very interesting. The discussion of the Youth in Government program, trash-canned at a recent council meeting, will be enlightening. At last report, none of the New Majority had requested that any information be discussed or presented. It will be interesting to see just what kind of "input" our young jailer/mayor makes on this issue. You will recall, his reason for discarding this program was because he hadn't had a chance to provide input in the nine months after it was first introduced. Talk about a slow learner! Sunday the Daily Pilot published one of my submissions under their "Sounding Off" banner (here). It's going to be very interesting to see what kind of comments are published in the online version responding to this particular piece. I'm thinking they will very likely prove my point. I'm grateful to the editors of the Daily Pilot for considering my commentary print-worthy.